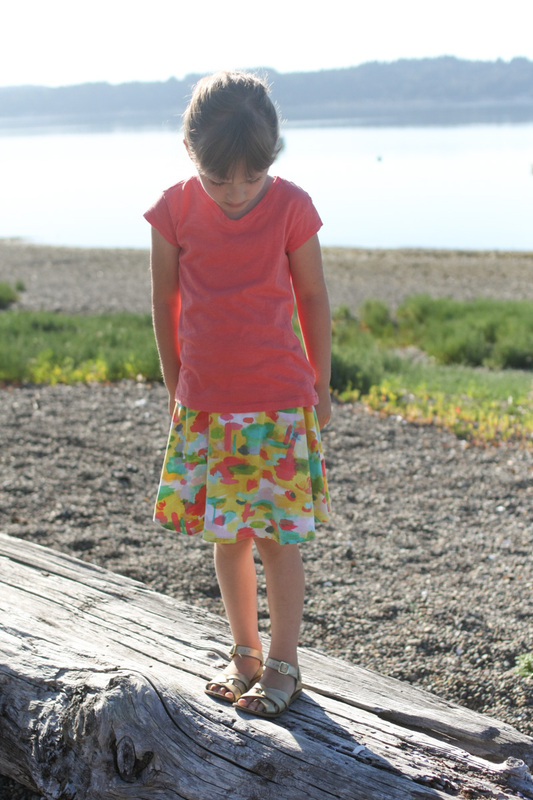 Make it Perfect has a new pattern, the Scout Skirt and Sweatshirt, and I tested the skirt back in June. I always look forward to Toni’s patterns, they’re some of my very favorites. This one is no exception – a super simple, swingy knit skirt. 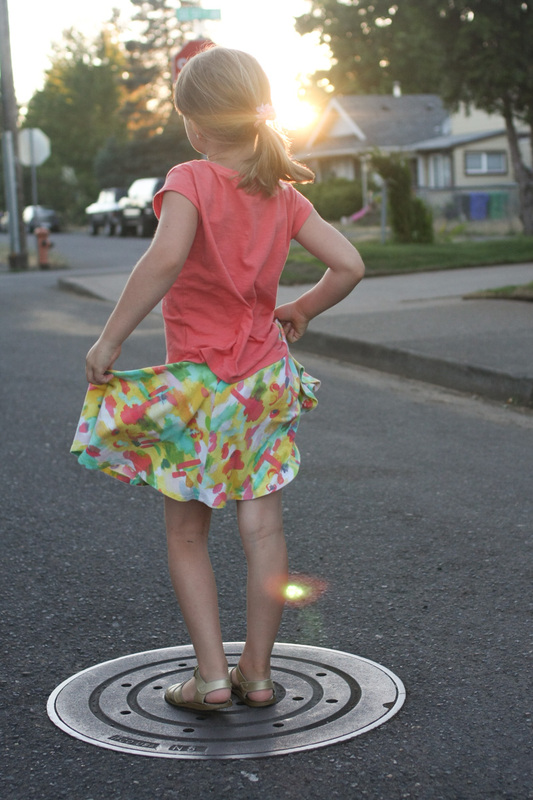 You can’t get much faster or easier than a skirt like this – a couple side seams, elastic in a knit waistband, and a hem. Speaking of which, I think I finally managed to figure out hemming knits on my machine – the twin needle really makes a world of difference. I don’t have a lot of knits on my shelves, so I went to my local Fabric Depot to pick something out. This is a Windham knit called Sunshine Serenade Soire. I’d never seen this print, but it jumped out at me with its water color-y look and bright colors. 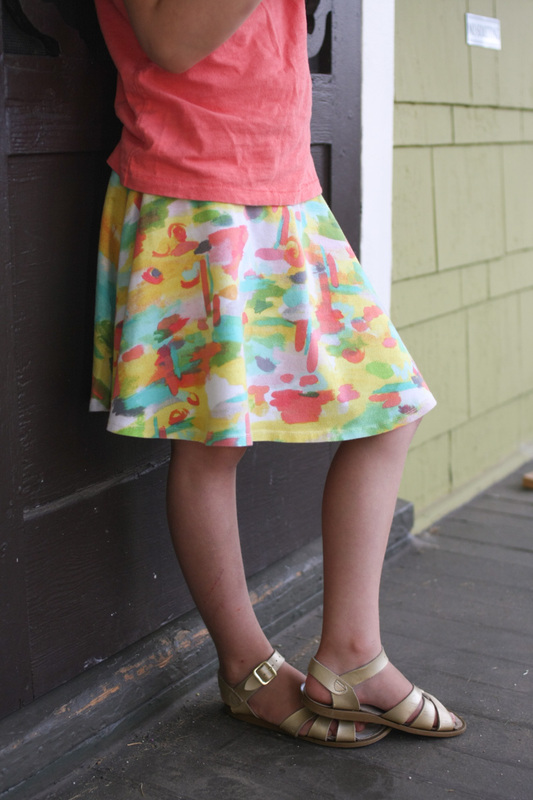 A print like this goes with almost every solid colored top Lila owns, which is a plus. 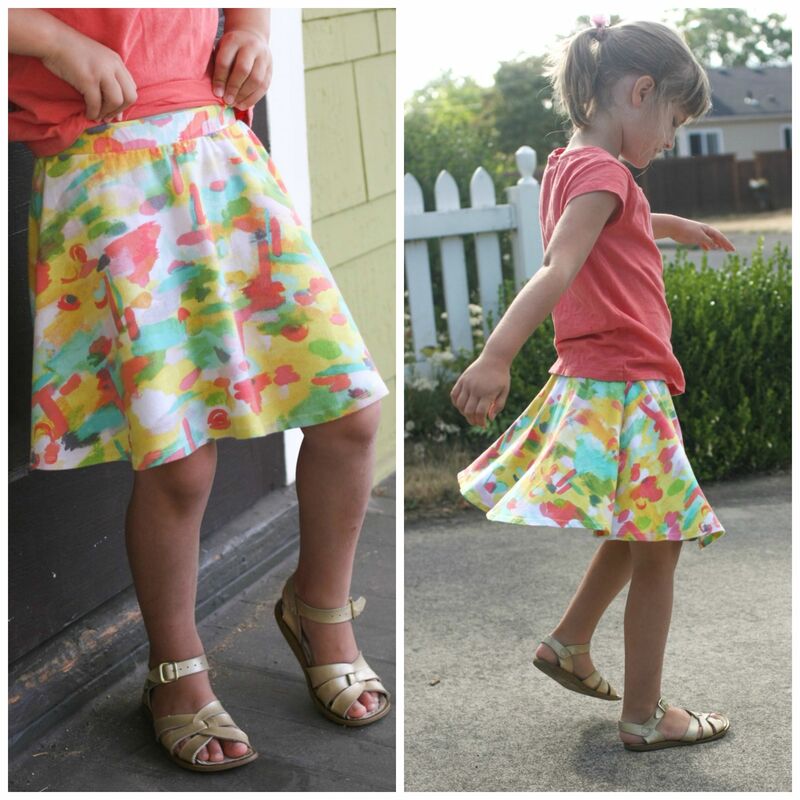 I made this skirt over a month ago and it gets chosen from the (sizable) skirt pile quite often – it’s comfortable and easy to wear and I can see myself making this one over and over again. This is a size 6 with no adjustments, and the fit is perfect. You can see Toni’s versions and read more about the Scout pattern here. I hope to try the sweatshirt too when the weather cools down. 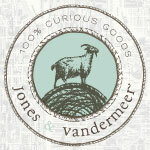 And check out the new Make it Perfect blog and shop – the site got a beautiful new make-over! 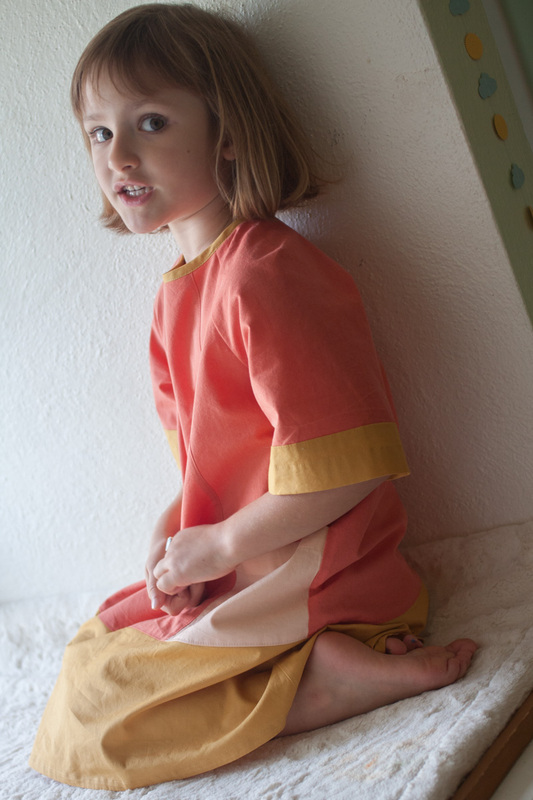 I cannot tell a lie, I didn’t sew this dress during Kid’s Clothes Week, not by a mile. But the pattern (the Oliver + S Carousel Dress) was just released, so while I continue on with Halloween and birthday sewing, I thought I’d share the tester version of the Carousel Dress I sewed over the summer. 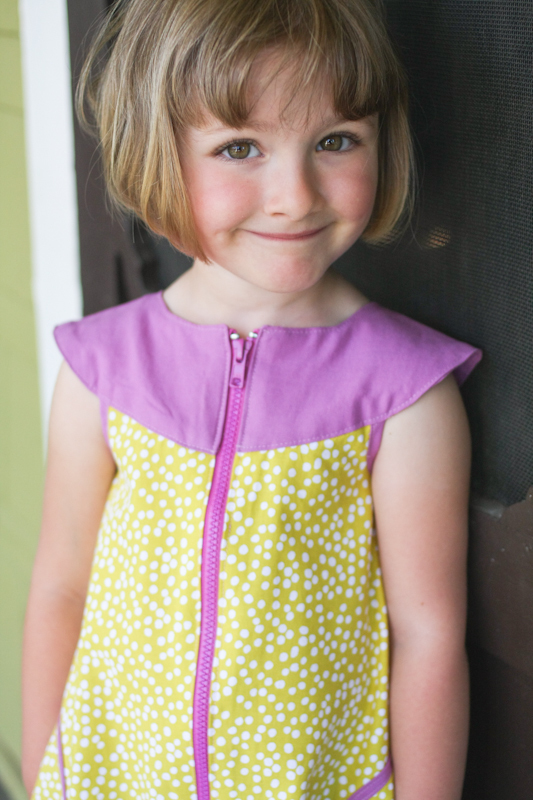 When I saw the sketch of this pattern, I immediately wanted to color block it – the hem and sleeve bands, the neck binding, the pockets – all nice spots for solids. The Carousel Dress has a simple, relaxed style and features raglan sleeves with shoulder darts and wide hem and sleeve bands. 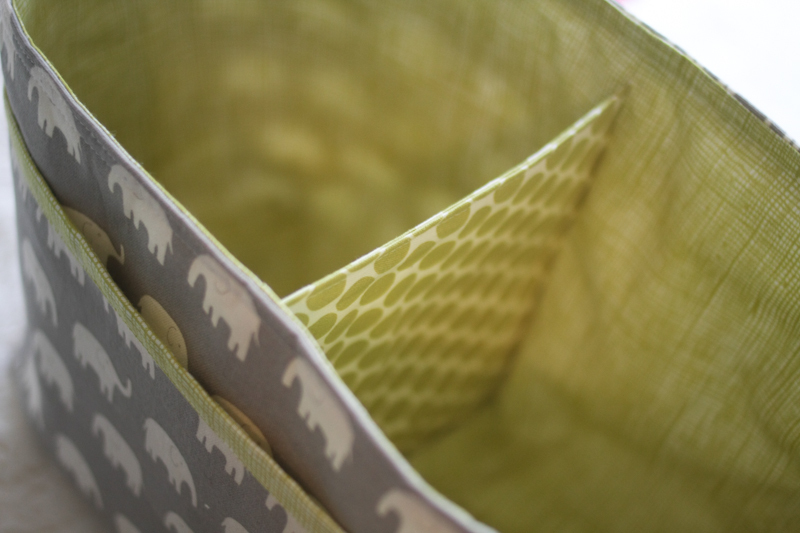 The front is made up of three panels, and the pockets are neatly enclosed in the seams. 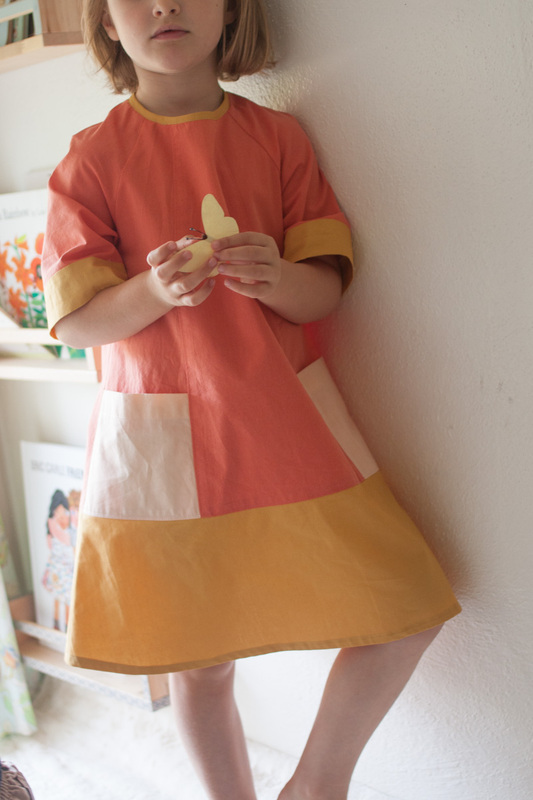 Because of the way the dress is pieced together, this pattern has lots of potential for combining fabrics or highlighting all those seams with top stitching. There’s also a ruffle hem option, if you’re into that sort of thing. 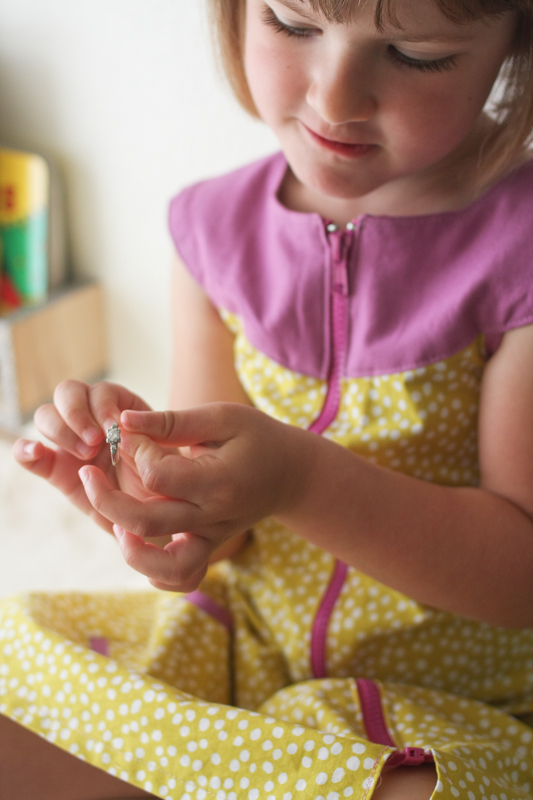 The keyhole opening at the back closes with a button and thread chain – a nice, simple closure. I’m all for leaving my buttonhole foot in the drawer. 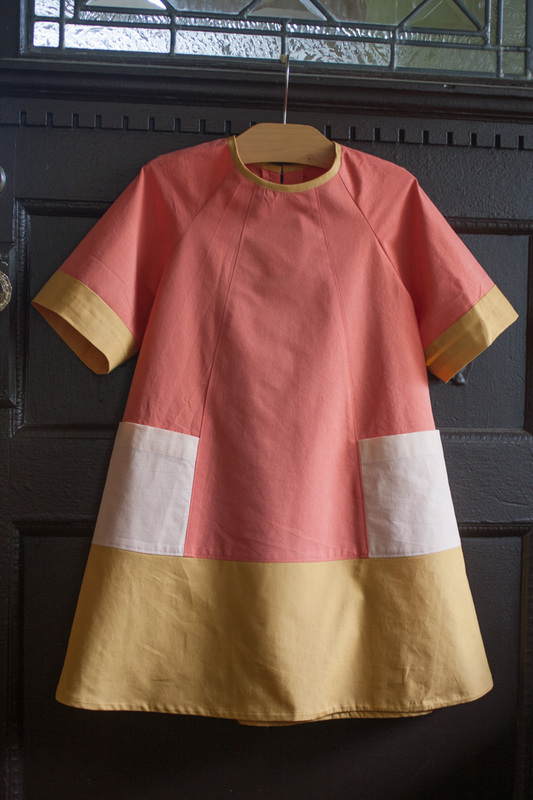 So back to the color blocking – the coral is a Modern Solid from In the Beginning, and the other two colors are Honey and Peach Sherbet from Art Gallery. The Art Gallery solids come in such beautiful colors and are some of the nicest quality solids I’ve found. 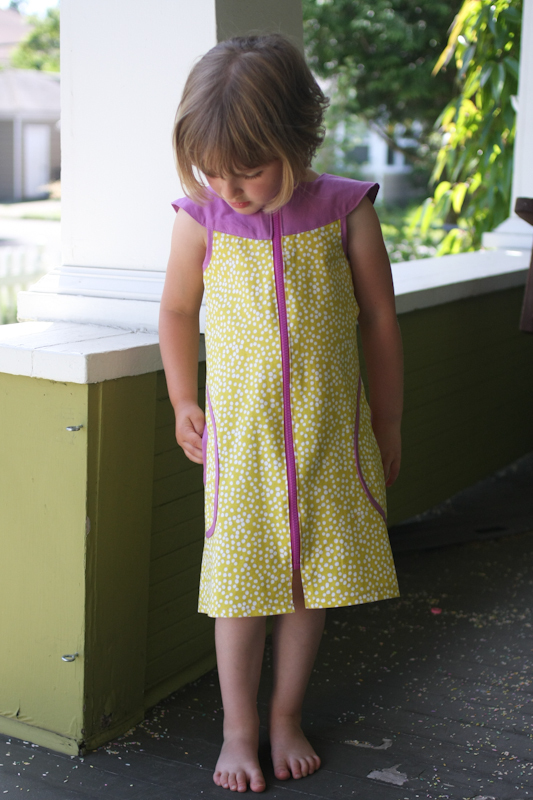 I sewed a size 5 for Lila and it seems a little big – I think she can still get away with a 4 in the patterns with a more relaxed fit. If in doubt, I might recommend sizing down (and adding length) with this one. 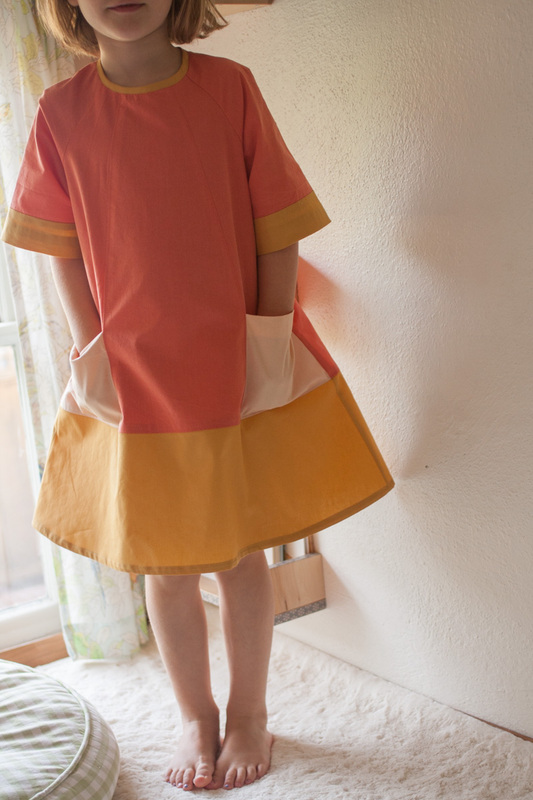 You can read more about the Carousel dress and see the pattern made up several different ways in Liesl’s introduction post. 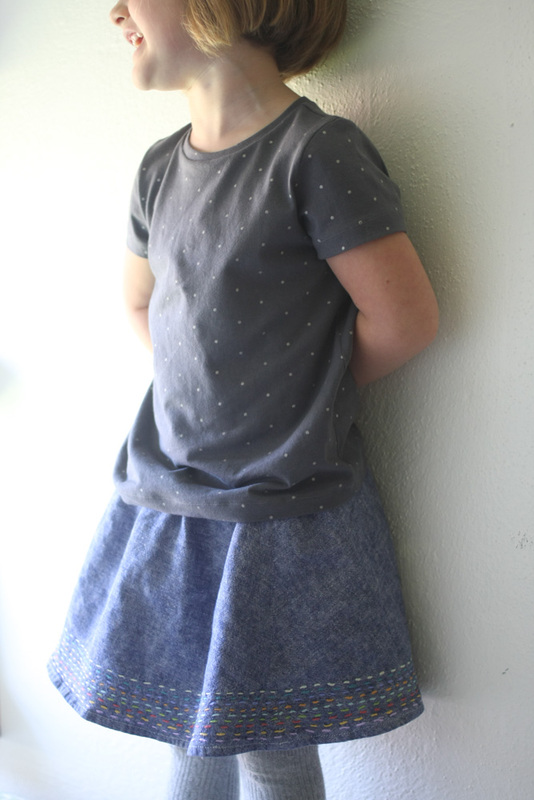 And there’s another new fall pattern – The Lunchbox Tee and Culottes – to check out as well! I made this shirt two weeks ago, so it’s technically a cheater KCW project. But Liesl of Oliver + S just announced her collection of digital t-shirt patterns (kids’, women’s, and men’s – you can outfit the whole family! ), and I was a tester for the kids’ version, the School Bus T-shirt pattern. I sewed up one for each kid, so I thought I’d share Lila’s today. 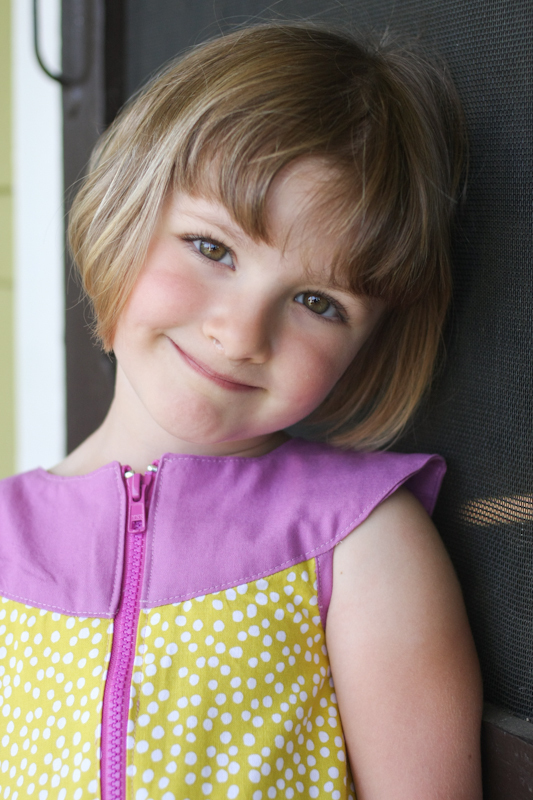 The School Bus pattern is a basic t-shirt that comes with several options – three different sleeve lengths and two neckband widths. This is View B, with a more feminine, capped sleeve and a narrow neckband. Views A and C are your standard short-sleeved and long-sleeved t-shirts. It’s so nice to have basics like this from trusted sources like Oliver + S – you always know just what you’re getting into, and it’s always something good. And as with all great basic patterns, the options for customization are endless. 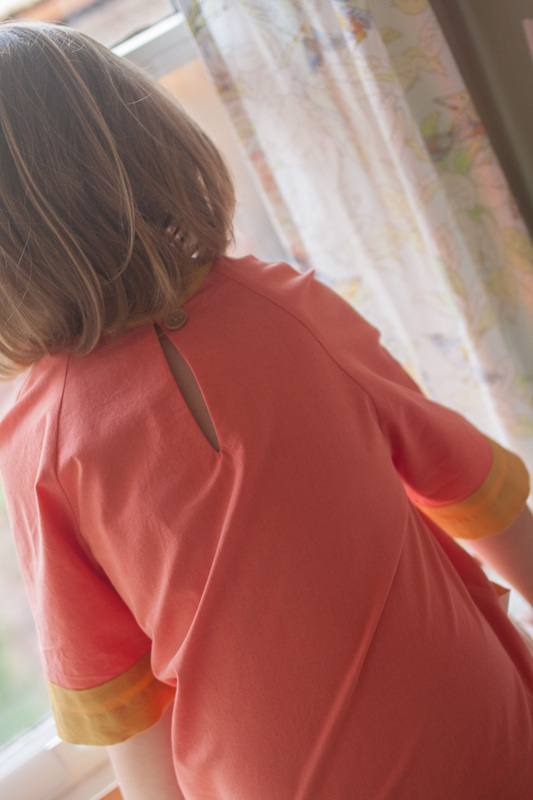 I sewed a size 5 and was really happy with the fit – it’s relaxed but not overly roomy, and the capped sleeves and narrow neckband definitely give View B a girlier feel. 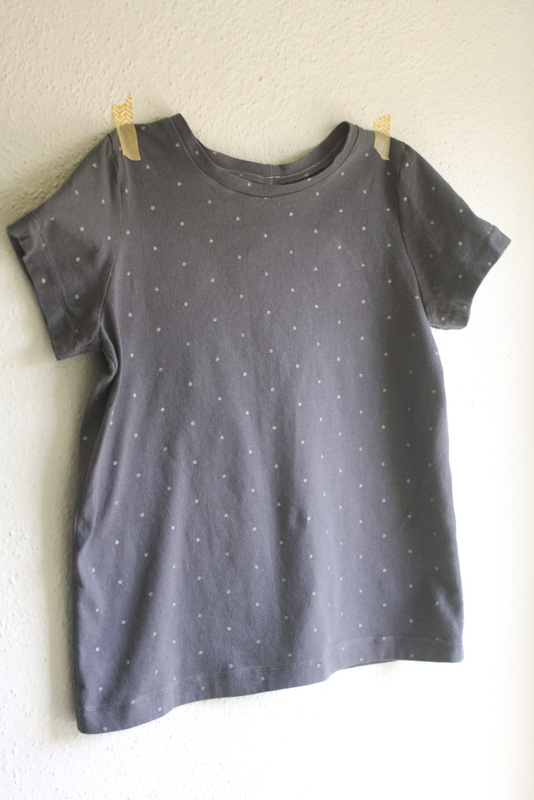 The silver dot knit came from a sale rack Old Navy tee. I don’t know if it was the fabric or the fact that I skipped the walking foot this time, but it sewed up like a dream. If you want more info on any of these new T-shirt patterns, check out Liesl’s introduction post on the the Oliver + S blog. Each pattern is available on its own, or you can purchase a “Family Pack” that includes all four (men’s, women’s, and two size ranges for kids). I’m looking forward to trying the women’s Metro T-shirt myself. After KCW, of course. 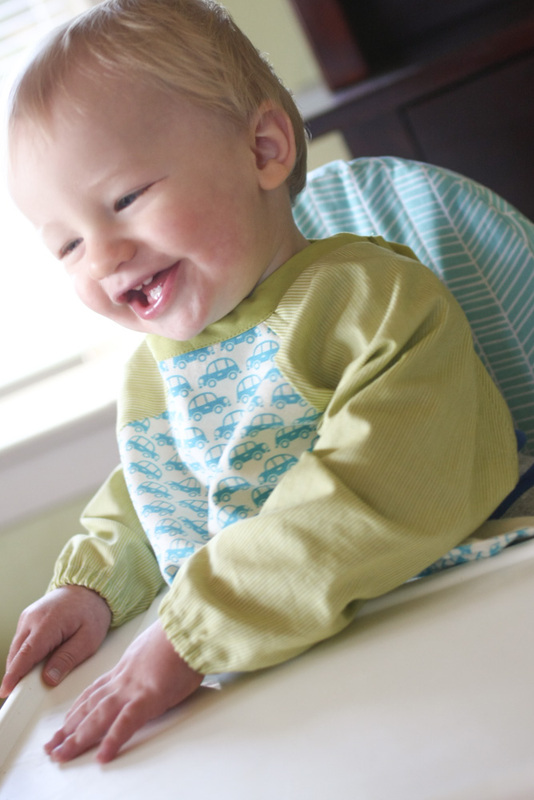 Many many months ago I tested the Keep Clean Bib pattern for Jen of Lea & Lars. Oscar wasn’t quite ready for bibs back then, and it somehow got lost in a mountain of unfolded fabric until just recently. But the timing is perfect – it fits, he’s a slob, and this thing has full coverage! 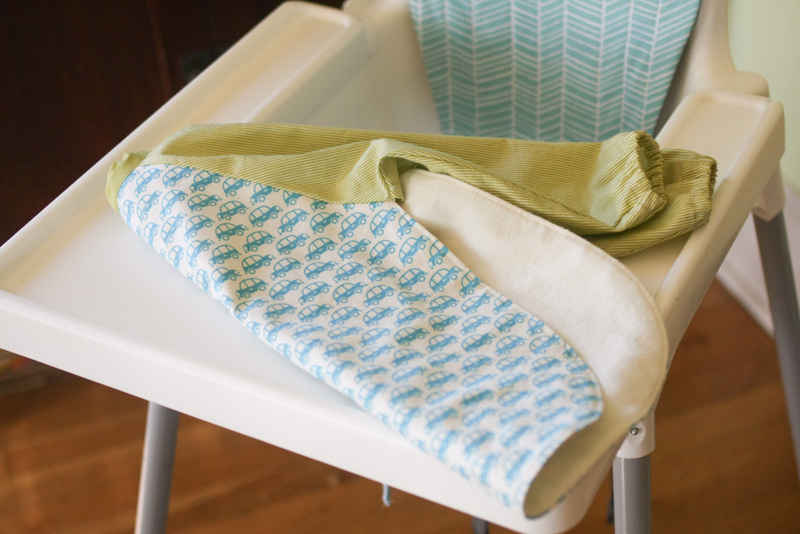 We had a similar bib from Ikea when Lila was a baby, but this one is better – the front is lined with flannel, and it’s so long that it doubles as bib and napkin-in-your-lap. Which is perfect, since it eliminates the need for the dishtowel I’d been using protect those fancy trousers he likes to wear. 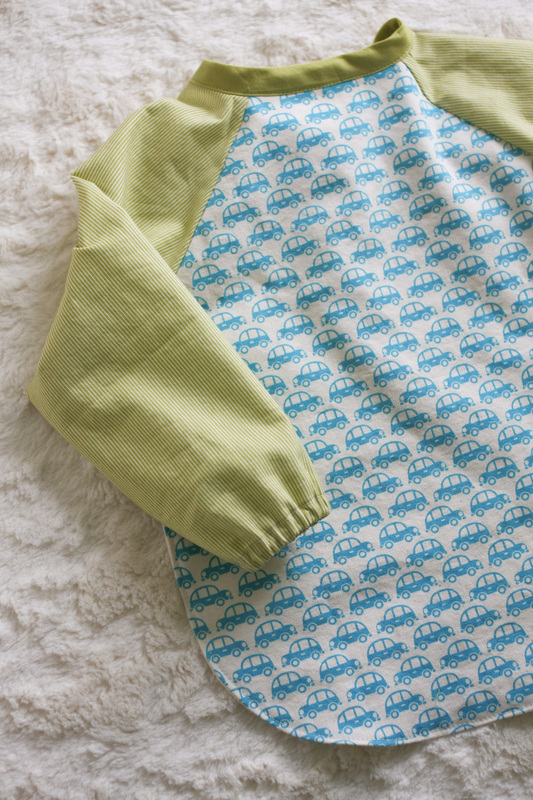 I bought the Kokka cars when I found out I was having a boy…you know, because I’d heard that boy babies like car fabric. And the green stripes are Sunkissed by Sweetwater for Moda. Luckily it all coordinates nicely with the new high chair cushion. 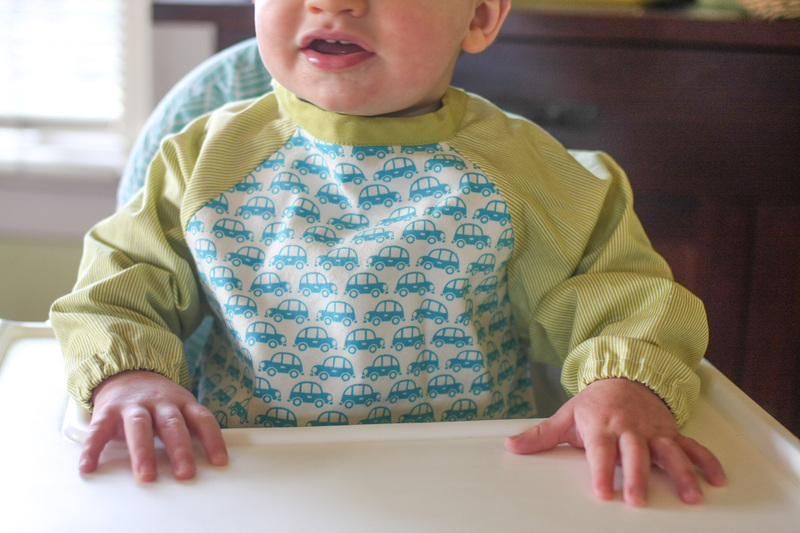 Anyway, the pattern is quick and simple-to-sew, and I think we’re going to get a lot of use out of this bib now that it’s been unearthed from the pile! P.S. The winner of the Gingercake On the Go Organizer pattern giveaway is Nichole (#52) – you should receive your copy of the pattern soon! 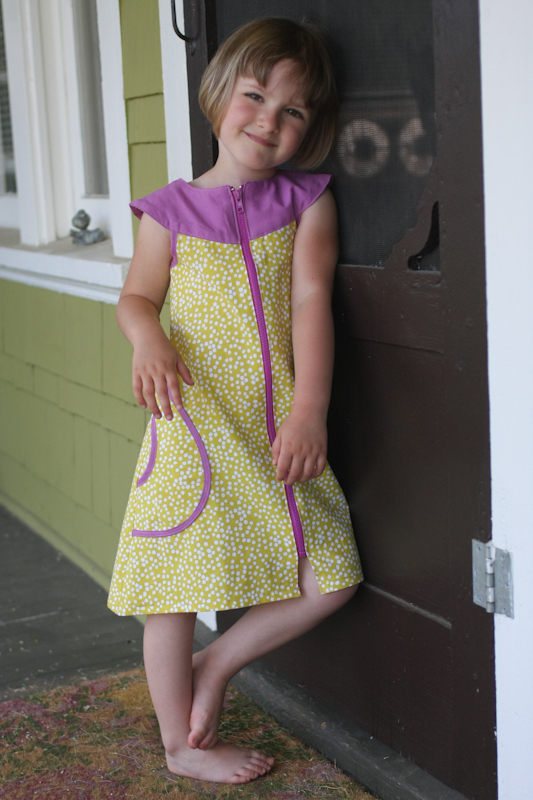 Last month I tested out a new pattern for Toni of Make it Perfect. She has a great selection of patterns for women, babies, and kids – I made her Serendipity Jacket this winter, and the Uptown Girl Jacket was one of my first major sewing projects for Lila. I’ve been a long-time fan of Toni’s patterns and blog, and I always look forward to what she’s got coming up next. It was really exciting to test for her and get to know her a bit in the process! One thing I love about pattern testing is that it helps to get me out of my comfort zone. 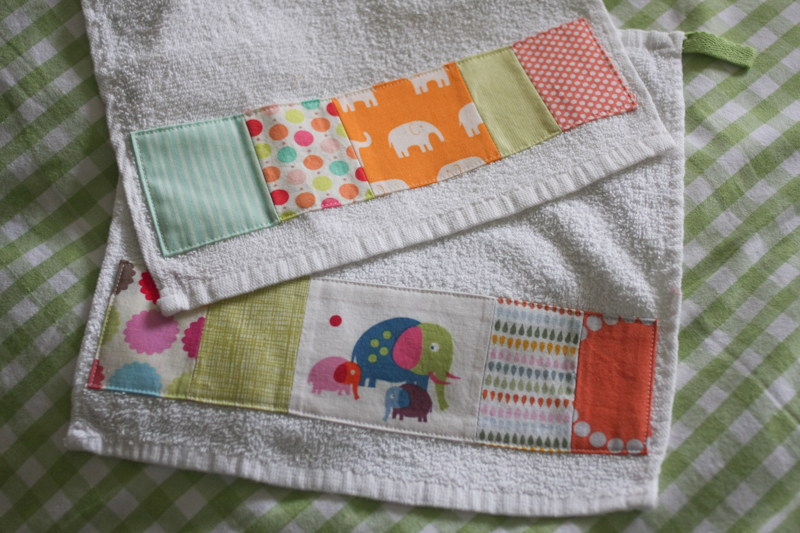 My sewing style pretty much matches my personality – I’m not much of a risk-taker. I feel like I get into a rut sometimes and choose very safe, conservative patterns, or just make the same things again and again. But this pattern is really fun – something I might not have chosen on my own, but am so glad I made. It’s called the Zip-It, named of course for the colorful zipper that runs down the front. I wanted to pick some bright and bold colors to go with the style of the dress. 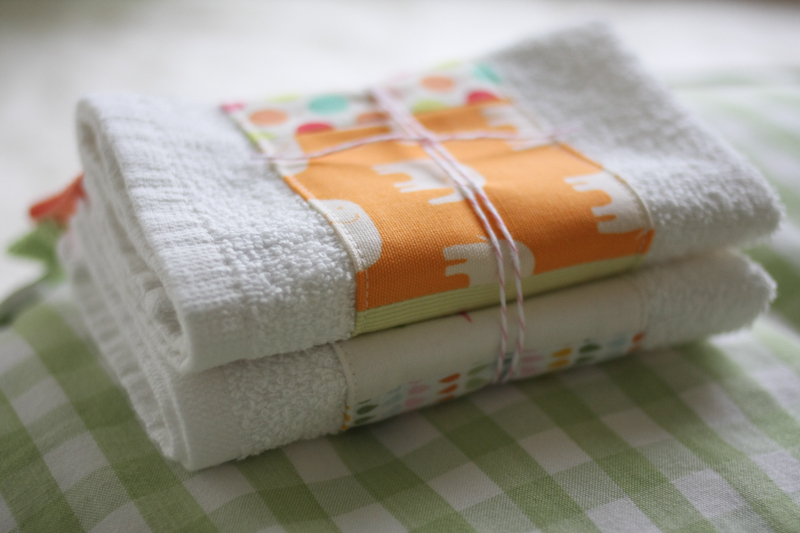 The yellow dots are Lotta Jansdotter’s Scatter Dots in Citron from the Bella line, purchased locally at Cool Cottons. Not sure exactly what the solid is, I just got it to match my zipper. Speaking of which – I had trouble finding a good color selection of 20-inch jacket zippers around town, so I ordered a few from Zipperstop on Etsy. No shortage of fun color options there! I was surprised by how incredibly easy it was to install a zipper in this manner – definitely manageable even for a zipper novice! If your zipper is heavy and your fabric is light, you may get a little waviness when the zipper goes in. I used some 1/2 inch stay tape along the front dress seams to keep the fabric from stretching with the weight of the zipper. 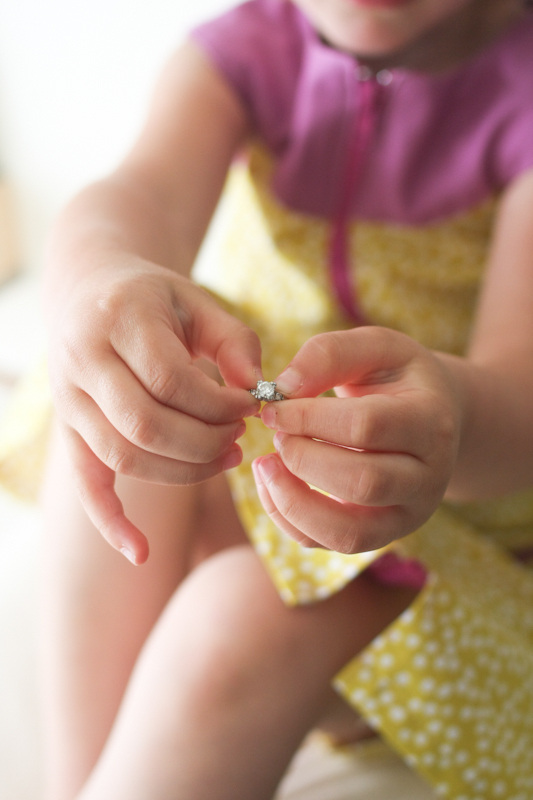 The remainder of this photo shoot is brought to you by my wedding ring – she begged me to take it off, and holding it apparently made her feel all responsible and grown-up. It was sweet, and it worked, so I went with it. There’s a new Noodlehead pattern on the scene! 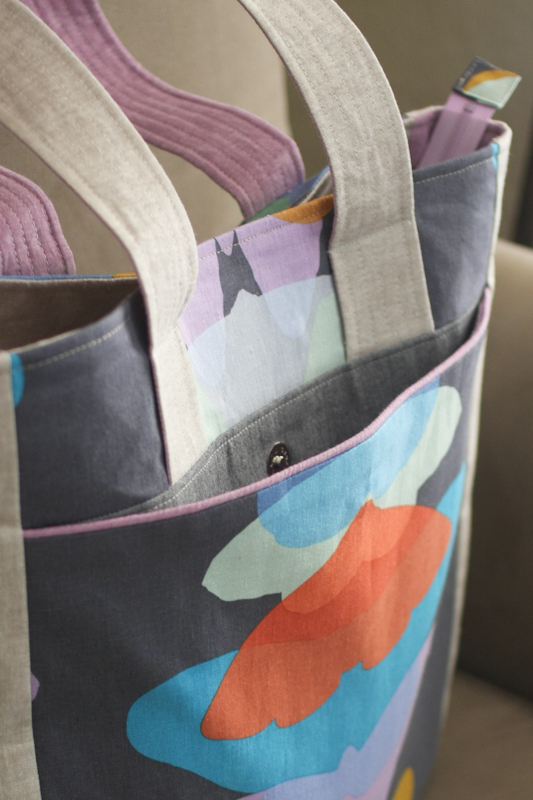 Anna just released her Super Tote pattern, and let me be the first to tell you, this thing really is super. 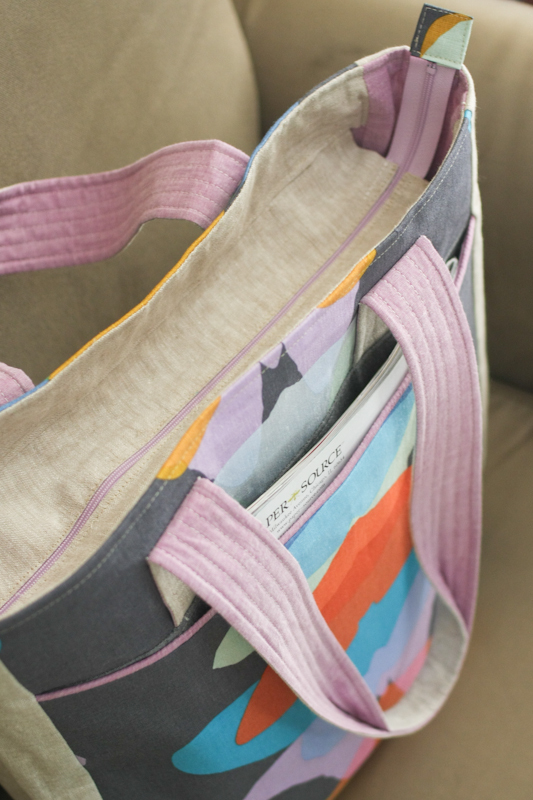 It’s a roomy tote bag with a recessed zipper, big front pocket, elasticized interior pockets, and space for just about everything. And like all her patterns, it’s superbly designed and full of professional details. I love that Anna lets me test her patterns because it means I have an excuse to do some selfish sewing, which would never happen otherwise. And as I mentioned in my Instagram feed, there was no way I was wasting this gorgeous fabric on my kid. And about this fabric – I fell in love with Anna Maria Horner’s Ghost Wing linen the moment I saw it online, but when I actually went to purchase it at Bolt, it was even more beautiful than I could’ve imagined. Seriously, photos don’t do this stuff justice. The colors are divine and the linen has a gorgeous drape (not all that relevant when you’re interfacing the hell out it for a bag, but still, it’s amazing). I think it might be one of my all time favorite fabrics to date. Oh, and speaking of interfacing – since the fabric was lightweight, I used both types of interfacing that Anna suggests (Pellon SF 101 and Craft Fuse 808), and it came out plenty sturdy. I have a tendency to make all my bags gray, but I loved Anna’s Melody Miller version so much that I had to use linen for the gusset. And now I can’t bring myself to use it because I don’t want it to get dirty! I knew there was a reason for all those gray bags. Oh well, for now I’m okay with just watching it hang on the wall. 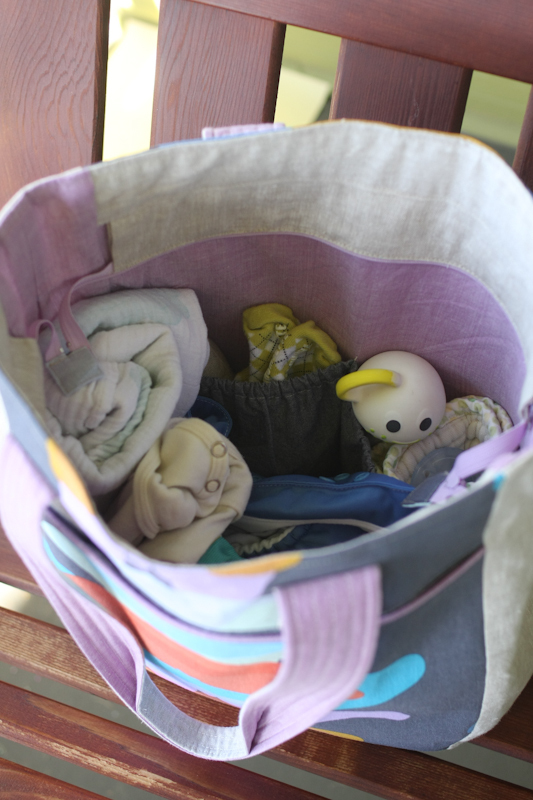 And for anyone thinking of using this as a diaper bag, it would be perfect. I emptied my current one inside just to see how things fit and there’s still plenty of space to spare! 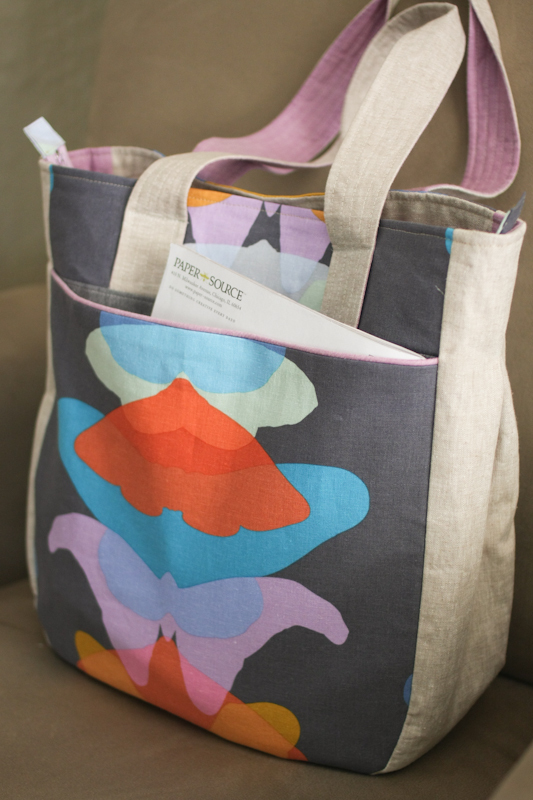 Check out Anna’s gorgeous versions of the bag and pick up your copy of the pattern here. 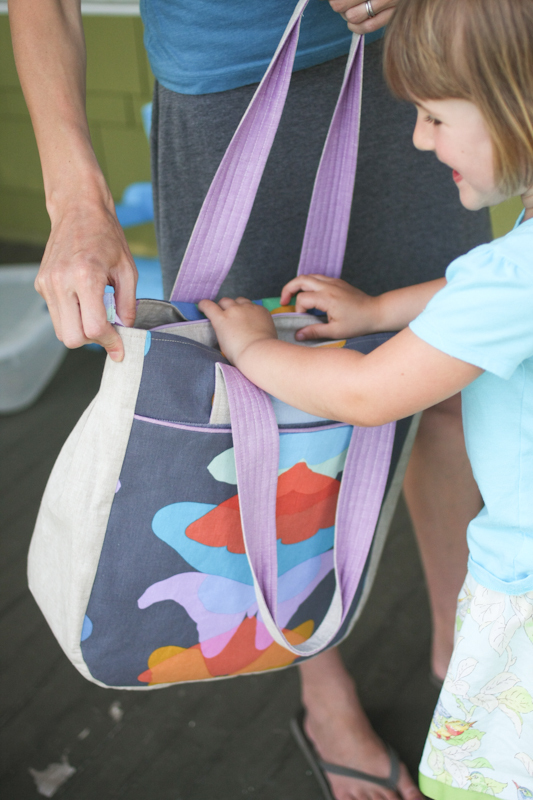 Then try to keep your kid’s paws off your new bag! Ever since Anna of Noodlehead posted her first divided baskets last month, I’ve been a little bit obsessed. Luckily I didn’t have to wait too long to make one – she got right to work making the pattern, and I even got to test it! A good friend of mine had a baby girl last week, and this one is for her. 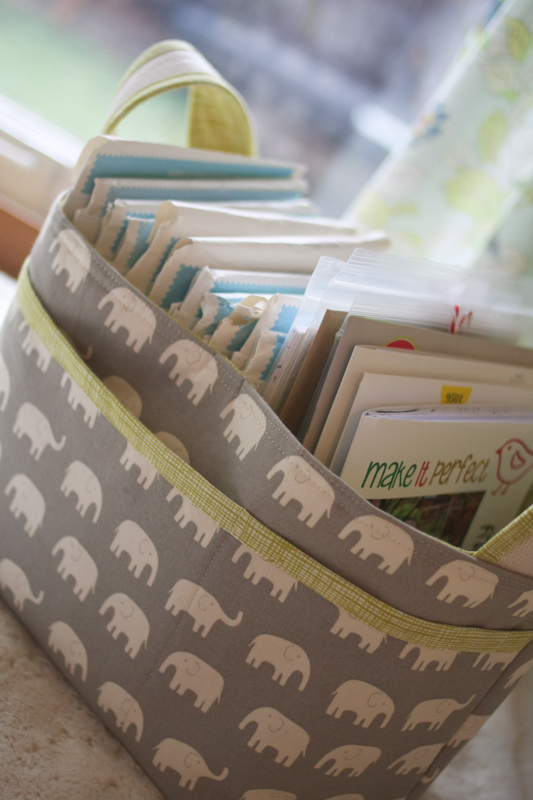 I made the pocket version of the basket, and divided it off-center to house a board book and a card. These things are so much fun to fill up, it’s hard to stop once you get going. 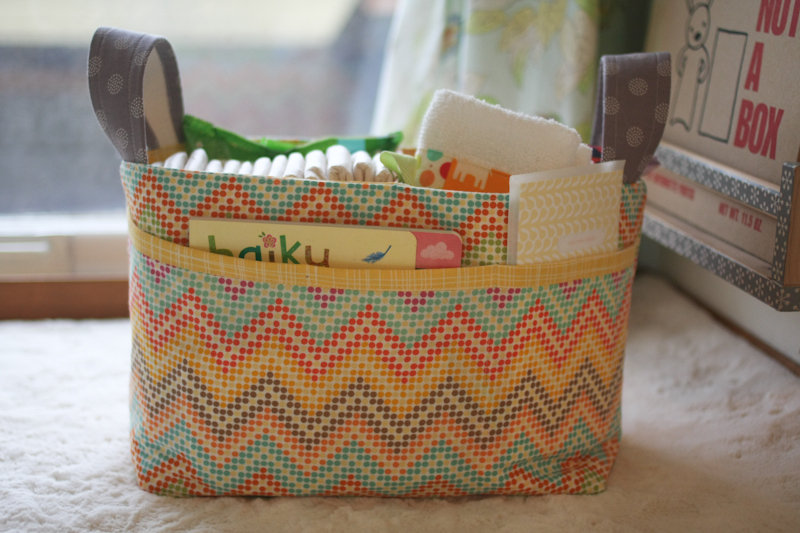 I filled this basket with diapers, wipes, a couple of my favorite board books, a little sleep sack, some TJs red licorice, and some patchwork washcloths. 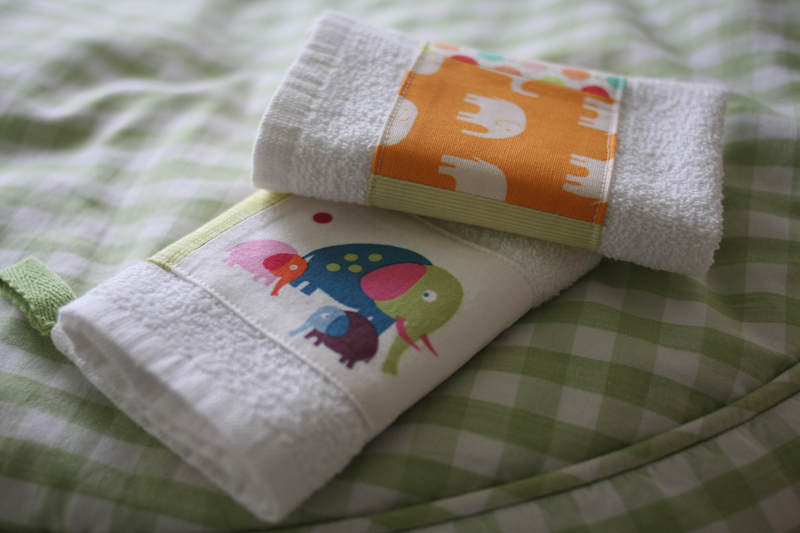 The idea for the washcloths came from this pin, and I loved them so much that I even used the same elephant fabric! I also discovered a lovely new blog in the process, A Cuppa and a Catch Up, and I even ended up buying Nova’s Nesting Fabric Bowls pattern, which I hope to post about soon. I wish the Ikea washcloths were a little better quality, but I guess you can’t expect too much at 10 for $3.99. And I do love the colorful little loops. 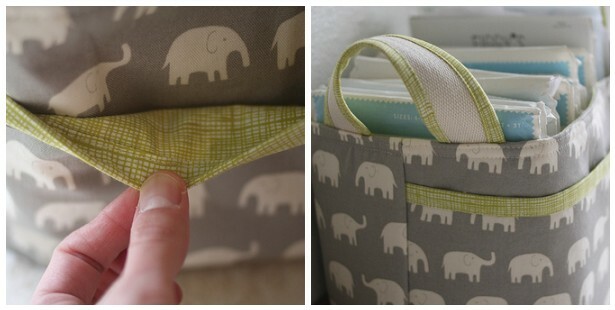 But back to Anna’s pattern…the fabric covered handles are one of my favorite parts. Mine ended up wrongside-out on my first basket, oops. 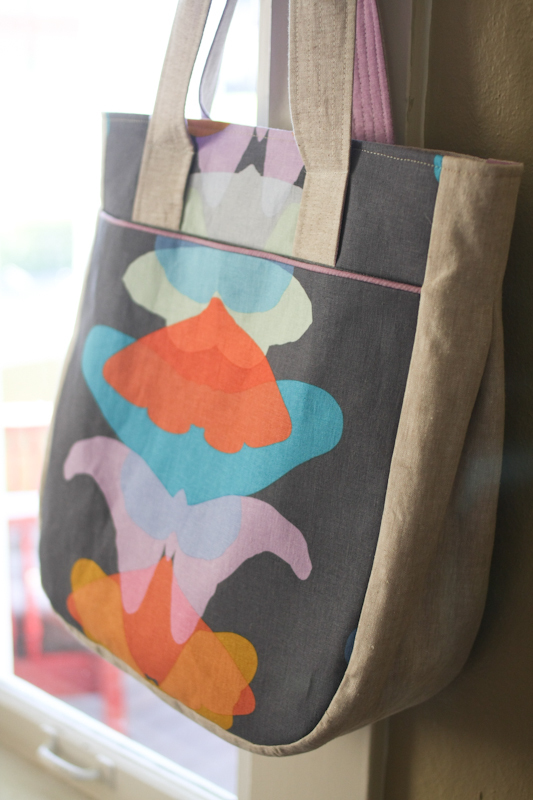 The handle fabric is a Moda Sweetwater Reunion print and the main fabric is an Andover print from the Frippery line. Here’s my second basket. More Daiwabo Tip Top elephants. This time I lined the front pocket, and I also managed to attached the straps correctly. 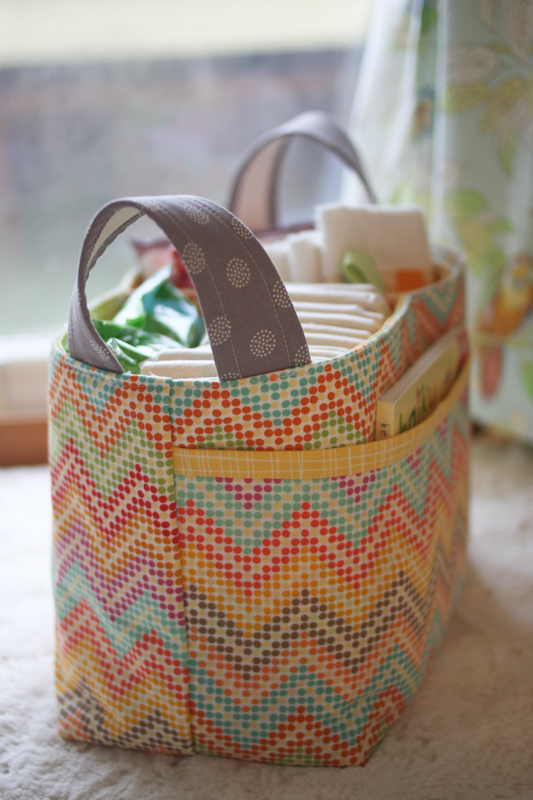 I love how Anna designed the basket with a divider – I had no clue how she did it before reading the pattern, but it’s really easy to construct with her directions. 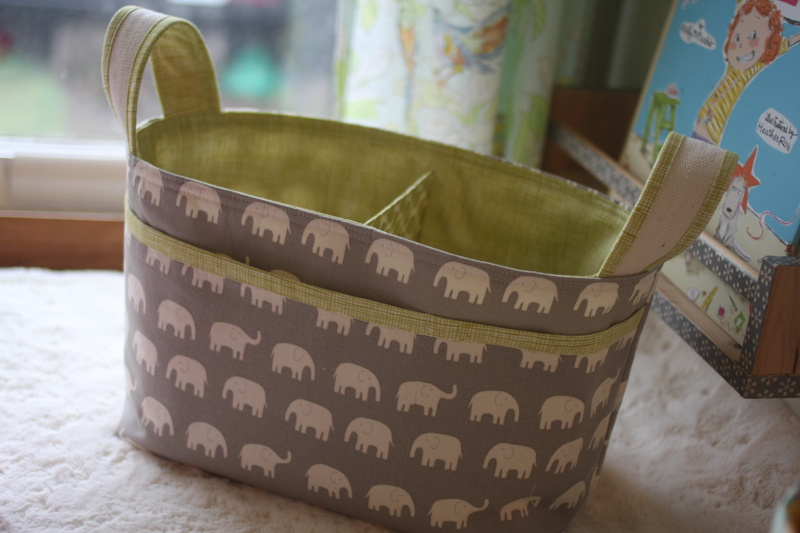 I think these baskets will make lovely new baby gifts, but they’ll also be great for storage around the house. 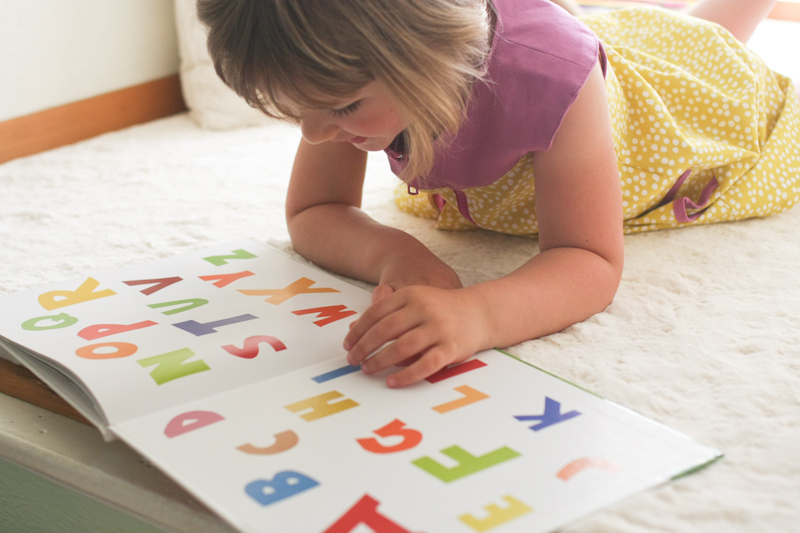 Toys, books, patterns…endless possibilities! 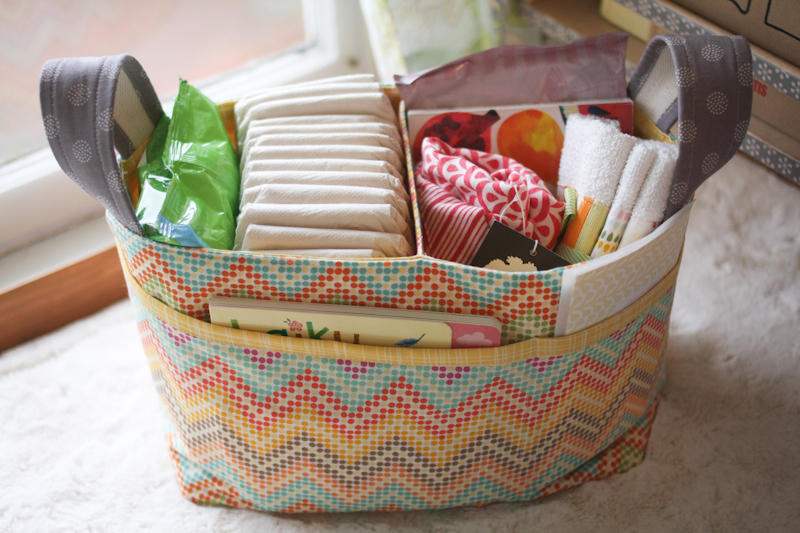 Get your Divided Basket pattern right here, you’ll be glad you did.